People often complain about weakness and pain in their legs. 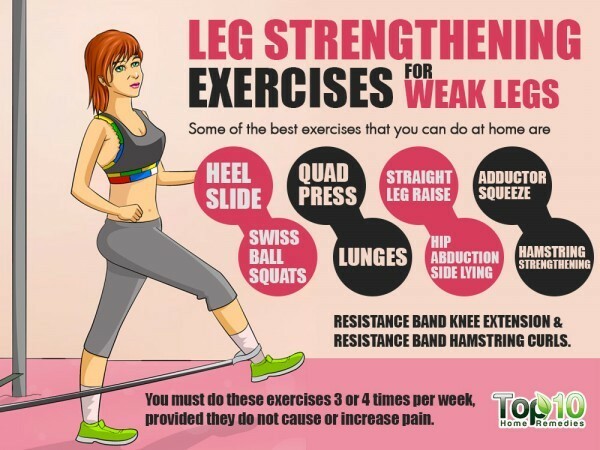 In simple terms, leg weakness means decreased strength. This can result from poor blood circulation, nerve damage, over-activity, lack of exercise, arthritis, recovery after surgery, side effects of prescribed medicines, dehydration, diabetes, anemia, back pain, nutritional deficiencies and certain serious illness. Muscle weakness can affect only one or both legs. The severity of the condition may vary from mild to severe. You can have accompanying symptoms like numbness or pain in the lower part of your leg, muscle spasms, prickling or burning sensations, redness, swelling, back pain, body aches, loss of muscle coordination and impaired balance. To strengthen weak leg muscles, you need a well-balanced diet, adequate fluids, a good exercise routine and proper rest. You can also use some natural home treatments to strengthen your legs and prevent further deterioration of muscle tissue. If you are experiencing recurring or chronic leg weakness, contact your doctor to determine the cause. It may indicate a serious issue for which proper treatment is required. Here are the top 10 ways to strengthen weak legs. Regularly massaging your legs helps improve circulation so that more nutrients reach the weak muscles to make them stronger. In addition, it helps reduce pain, inflammation and swelling. It also contributes to full-body relaxation and relieves stress and anxiety. Take some warm olive, coconut or mustard oil. Using gentle yet firm strokes, massage your weak legs for 10 to 15 minutes. Walking is a gentle exercise that helps build strength in your legs as it firms and tones the muscles. It also improves circulation. Walk for a minimum of 30 minutes, at least 5 times a week. If you have difficulty walking, use some kind of support or consult your doctor for suggestions. 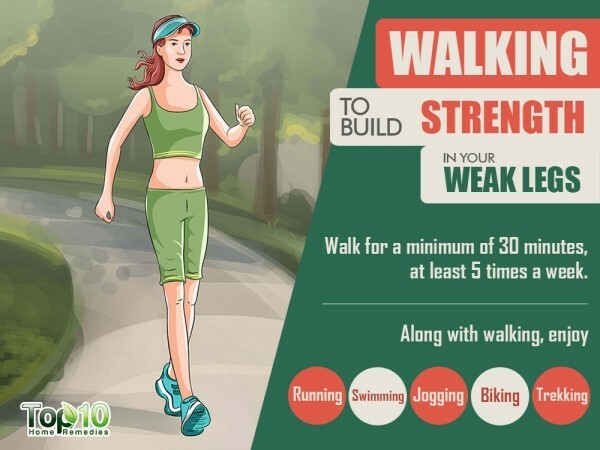 Along with walking, enjoy running, swimming, jogging, biking, trekking and similar activities a few times a week to help strengthen your weak legs. You must do these exercises 3 or 4 times per week, provided they do not cause or increase pain. You can also do yoga and Tai Chi. Always discuss the suitability of these exercises with your doctor. Also, learn these exercises from an expert. Vitamin D deficiency is associated with muscle weakness, according to a 2002 study published in the American Society for Clinical Nutrition journal. It also helps regulate two minerals – calcium and phosphorus, which are important for healthy bones. Spending some time in the sunlight can help provide vitamin D as your body makes this vitamin with the help of the sun’s ultraviolet (UV) rays. Simply expose your legs to early morning sunlight for 10 to 15 minutes daily. Also, eat more vitamin D-rich foods like salmon, sardines, mackerel and fortified milk, orange juice or cereal. You can even take a supplement, after consulting a doctor. 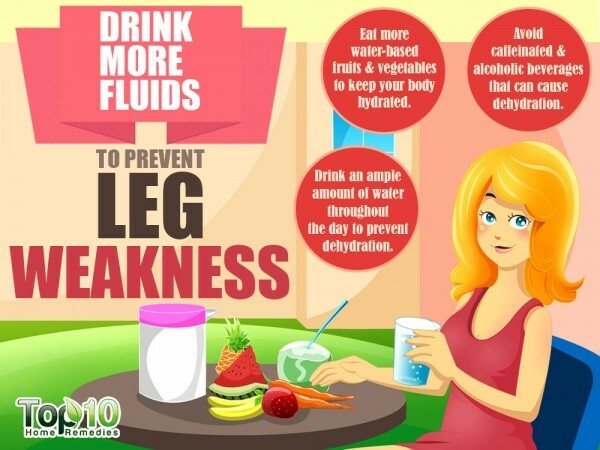 Dehydration is one of the main causes of leg weakness and muscle cramps. Rehydrating your body can easily reduce this condition. Drink an ample amount of water throughout the day to prevent dehydration. Also, eat more water-based fruits and vegetables to keep your body hydrated. Avoid caffeinated and alcoholic beverages that can cause dehydration. Note: People who have kidney problems must consult a doctor before increasing fluid intake. To maintain strong muscles and prevent leg weakness, you can try blackstrap molasses, which is a good source of iron, B vitamins, calcium and potassium. While the iron helps fight anemia, B vitamins are essential for healthy muscles. Calcium helps provide energy to your muscles and potassium helps maintain the electrolyte balance in the body.